On January 12th more than 350 people gathered for the annual winter event, We are so humbled, honored, and inspired by the beautiful evening featuring our youth, parents, generous supporters and many guests. Because of you, we are keeping hope alive for peace in Jerusalem. Thank you. Shukran. Toda. We would like to thank the youth, families, friends, and supporters for making the event so special! Special thanks to the US Consulate General of Jerusalem, USAID West Bank/Gaza, USIP, the BYU Jerusalem Center, and HeartBeat. – Photo magnet stations where the everyone could get their pictures on magnets. – Merchandise table where sweatshirts, candles and mugs were available for purchase. – Map of Jerusalem, where kids pinned where they come from within Jerusalem on a map that the Roots group created a week before the event. – A screening of the #KeepHopeAlive video, you can watch on THIS LINK. – And of course the food and beverages table with hot chocolate, pizza, and snacks. The program started with an introduction of the two masters of ceremony ( Maytav & Zeina ), and greetings from Mr. Tawfiq Alawi “Abu George” a father of George from Leap, and also the co-director of the BYU Center who hosted the event. 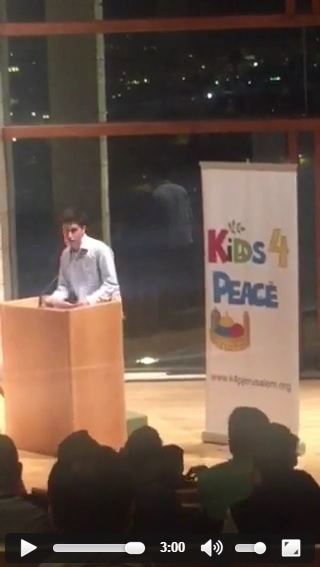 Tawfiq spoke in all three languages welcoming Kids4Peace to the center. Then he introduced the BYU pianist who played an amazing piece on the organ for the audience. And then it was time for the USAID mission director, Dave Harden to take on the stage starting with a Taylor Swift song Shake it off, preparing for his inspiring speech, where he got everyone in the auditorium engaged with his words commenting on the words of Dr. Martin Luther King’s speech and showing the kids that it is possible to create change. Kids4Peace has received a $100,000 fund from USAID for our program “Peace Builders Forum”. Yazan and Eyal introduced the parents afterwards, Doron father of Ariel , and Hala mother of Louis and Zaina spoke about their experience as parents in Kids4Peace, and how that affected their lives and their Kids lives, click here to read Hala’s story in Arabic and Hebrew. HeartBeat youth band played a few songs to the audience, and also inspired the kids that there are other organizations that share similar ideas and other youth that are acting for change in different ways. The evening ended with the Kids4Peace International Executive Director Fr. Josh Thomas’s words of encouragement, hope, and faith to the community along with the Kids4Peace International Board President Diane Nancekivell presence and beautiful words to the kids.